From left are: Geoffrey Lovelace, Joshua Smith, Jocelyn Read and Alfonso Agnew. For the first time, scientists have observed ripples in the fabric of space-time called gravitational waves, arriving at the earth from a cataclysmic event in the distant universe. This confirms a major prediction of Albert Einstein’s 1915 general theory of relativity and opens an unprecedented new window onto the cosmos. Gravitational waves carry information about their dramatic origins and about the nature of gravity that cannot otherwise be obtained. Physicists have concluded that the detected gravitational waves were produced during the final fraction of a second of the merger of two black holes to produce a single, more massive spinning black hole. This collision of two black holes had been predicted but never observed. (LIGO) detectors, located in Livingston, Louisiana, and Hanford, Washington, USA. The LIGO Observatories are funded by the National Science Foundation (NSF), and were conceived, built and are operated by Caltech and MIT. The discovery, published today (Feb. 11) in the journal Physical Review Letters, was made by the LIGO Scientific Collaboration (which includes the GEO Collaboration and the Australian Consortium for Interferometric Gravitational Astronomy) and the Virgo Collaboration using data from the two LIGO detectors. LIGO research is carried out by the LIGO Scientific Collaboration, a group of more than 1,000 scientists from universities around the United States — including Cal State Fullerton — and in 14 other countries. A computer simulation of gravitational waves from merging black holes, consistent with the gravitational waves that LIGO observed. The three-dimensional space is shown as a two-dimensional surface, with one dimension removed. The black holes' strong gravity curves the space near them into funnel shapes. As the black holes spiral together and merge into one, gravitational waves ripple outward. The movie is shown in slow motion, about 40 times slower than real time. 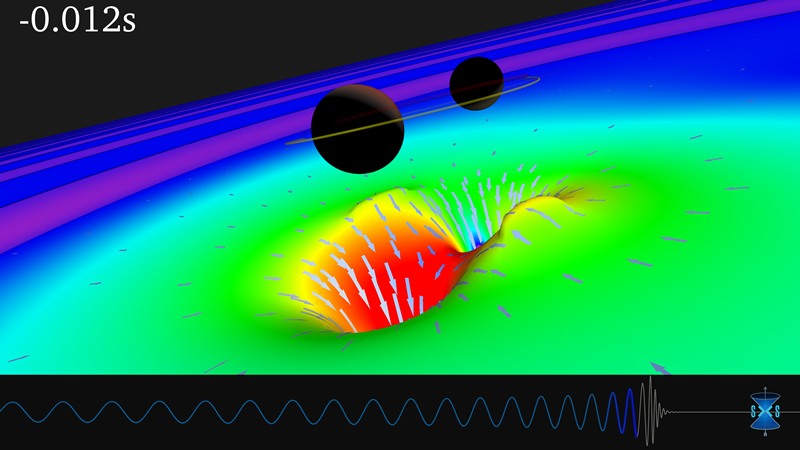 A computer simulation of the merging black holes whose gravitational waves LIGO observed. The black holes' strong gravity warps the light rays coming from the distant stars, gas and dust. The movie is shown in slow motion, about 80 times slower than real time. Cal State Fullerton — the only university in Orange County with gravitational-wave researchers and one of just three universities in Southern California involved in the global research effort — and its team of scientists and student researchers are key contributors to the first direct detection of gravitational waves. 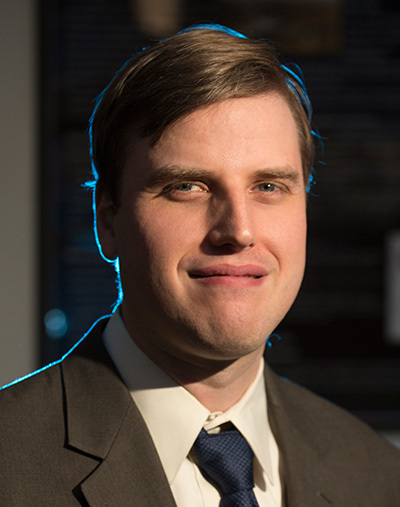 "This discovery inaugurates a new era of astronomy, where we are able to measure the movements of black holes from across the universe by the gravitational waves they give off," said Joshua Smith, associate professor of physics, who is leading the Titan team of faculty and student physicists and mathematicians. "Scientific advances in technology and astrophysics have now allowed us to observe two of Einstein's general theory of relativity's most elusive predictions: the existence of gravitational waves and black holes. From this point on, we will continue to observe the universe in this completely new and exciting way," Smith said. The technology required for LIGO also has led to advancements in lasers, optics and detection science, and through research and development, will continue to do so into the future, Smith added. CSUF collaborators with Smith are faculty colleagues Jocelyn Read and Geoffrey Lovelace, both assistant professors of physics; and Alfonso Agnew, professor of mathematics. As members of the LIGO Scientific Collaboration, Smith, Read and Lovelace are co-authors of the Physical Review Letters journal article outlining the discovery. Joseph Areeda, a computation specialist in Cal State Fullerton's Gravitational-Wave Physics and Astronomy Center, along with six CSUF physics graduates, also are co-authors. Additionally, Smith served as one of the primary editors of the discovery article, along with physicists from Caltech, MIT, Albert Einstein Institute in Germany, University of Paris and the University of Rome. "It's been a tremendous honor for me to serve as one of the six primary editors on the paper. This team coordinated the writing and figures describing the collaborative work that led to this landmark discovery," Smith said. Read is involved with preparing public material explaining the discovery and contributed to work estimating the parameters of the gravitational-wave source that is detailed in a companion paper; and Lovelace and his students contributed simulations of two black holes merging that are featured in the journal article. For the last several years, the Titan physicists also have served in key roles with the LIGO Scientific Collaboration. 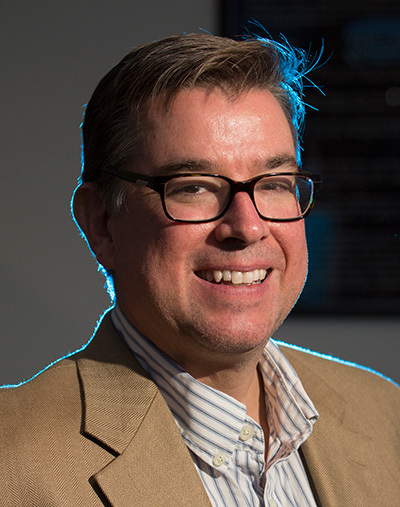 Smith has chaired the collaboration's detector characterization group and served on its executive committee. 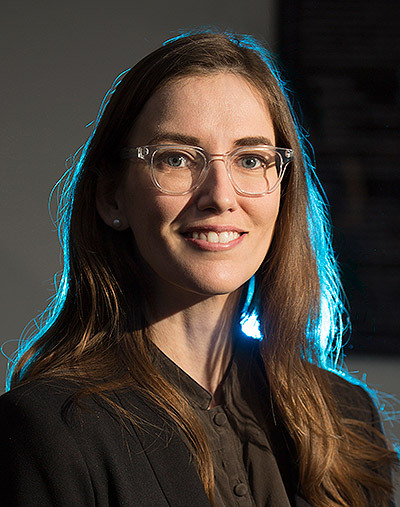 Read currently serves as co-lead of the binary neutron star sub-group and has served as co-chair of the Academic Advisory Committee and an editor of LIGO Magazine. Additionally, Lovelace serves on the executive committee of the Simulating eXtreme Spacetimes numerical-relativity collaboration, a multi-institutional research effort, which includes CSUF. 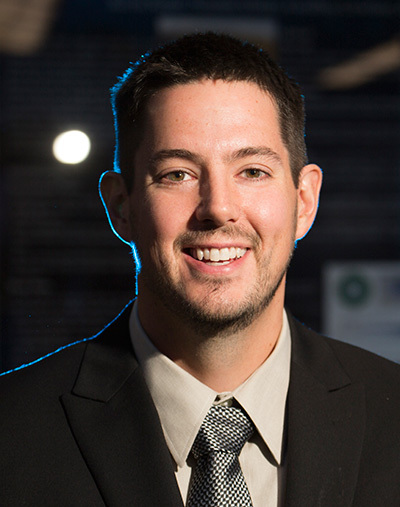 Agnew, a CSUF alumnus, studies theoretical relativity with his research focusing on mathematical methods to find and study cosmological and astrophysical solutions of Einstein’s equations. Specific to the LIGO experiment, he is examining methods and complex analytical techniques to build and study models of the objects that emit the gravitational-wave signals. A computer simulation of gravitational waves from merging black holes, based on data acquired on September 14, 2015 by the LIGO detectors. The three-dimensional space is shown as a two-dimensional surface, with one dimension removed. The black holes' strong gravity curves the space near them into funnel shapes. As the black holes spiral together and merge into one, gravitational waves ripple outward in a spiral pattern. Above the funnels, the two small orange spheres are the horizons of the black holes. Nothing, including light, can escape from inside the black holes' horizons. CSUF physics students Alyssa Garcia and Nicholas Demos helped to create this image from the computer simulation, with their faculty mentor Geoffrey Lovelace, who performed this simulation using the Spectral Einstein Code. This is a snapshot of a movie showing a binary black hole merger simulated by the SXS collaboration. The system of two black holes has parameters consistent with the discovery of gravitational waves on Sept. 14, 2015. The top part of the image shows the apparent horizons of the orbiting black holes, and the colorful plane shows the warping of space and time; the shape indicates the strength of the space-time curvature, the color indicates the rate of the flow of time and the arrows indicate the dragging of space by the rotation of the black holes. At the bottom of the image is a plot of the gravitational wave as it appears at a large distance away from the black holes (for instance, on Earth, where the LIGO instruments measure these waves). Image by Harald Pfeiffer/SXS. Listen to the sound of gravitational waves as detected by LIGO Observatories. Predicted by Einstein a century ago as a consequence of his general theory of relativity, gravitational waves are ripples of warped space and time — like ripples on a pond — produced by violent events of great energy in the universe, such as supernova explosions or colliding black holes. As these waves travel to Earth, Smith explained, they bring with them information about their violent origins and about the nature of gravity that cannot be obtained by other astronomical tools. "Gravitational-wave observations provide tests of Einstein's theory of relativity under the most extreme conditions," said Smith. "This direct detection confirms Einstein's vision of the waves and gives us a riveting new window into cataclysms in the cosmos." Gravitational waves also are important in better understanding black holes, which could lead to learning more about the origin of the universe, Lovelace said. "Predicting the gravitational waves from merging black holes and neutron stars helps to maximize waves that the detectors will see," added Lovelace. Read explores how neutron stars produce gravitational waves, using a combination of computer simulations and mathematical models to predict the shape of the gravitational waves that are produced by two neutron stars in a binary system spiraling toward each other and colliding. "The waves encode information about the two stars, such as how massive they were and how compact they were," Read said. The Gravitational-Wave Physics and Astronomy Center, opened in fall 2012, is the hub for faculty-student research (http://news.fullerton.edu/2013sp/Gravitational-Wave-Center-Research.asp) activities related to the discovery. The center supports gravitational wave research, education and outreach in gravitational-wave astronomy, physics and astrophysics. CSUF faculty researchers have received more than $2 million in external funding for their gravitational-wave studies, including grants from the National Science Foundation. Grant funding also supported building the supercomputer, ORCA, in which high-performance computing hardware and software are used to model gravitational waves. To date, about 40 students have had the opportunity to work on this groundbreaking research, enhance their scientific and computing skills, present at national conferences and co-author peer-reviewed journal articles, said Smith, who serves as the center's director. Some students have also conducted gravitational wave research abroad in Italy (http://news.fullerton.edu/2014su/physics-student-italy.asp) and Korea, and visited the LIGO Observatories. Seven CSUF alumni are currently enrolled in doctoral programs related to gravitational wave research at such institutions as Caltech, Syracuse University and Louisiana State University, located near the LIGO Livingston Observatory. The discovery was made possible by the enhanced capabilities of Advanced LIGO, a major upgrade that increases the sensitivity of the instruments compared to the first-generation LIGO detectors, enabling a large increase in the volume of the universe probed — and the discovery of gravitational waves during its first observation run. The U.S. National Science Foundation leads in financial support for Advanced LIGO. Funding organizations in Germany (Max Planck Society), the U.K. (STFC) and Australia (Australian Research Council) also have made significant commitments to the project. Several of the key technologies that made Advanced LIGO so much more sensitive have been developed and tested by the German UK GEO collaboration. This site is maintained by Strategic Communications.